When God doesn't answer your prayers, you have to take matters into your own hands. Matters like what? Matters like saving Mom and Dad's marriage, saving Cyrus, and keeping your family in one piece. Hailey's family has been through more than their share of miseries. With a mother recovering from a miscarriage and a father jobless for five months, Hailey figures her parents' marriage is going to end up in a divorce. Her brother Cyrus can't seem to stay out of trouble either. Besides, their financial hardships may eventually end them up in losing their house. Hailey and Cyrus often hang out in an old abandoned bank with a man called Moses. His lopsided religious beliefs eventually drive them to commit a crime. Finally, Hailey and Cyrus find themselves in yet another trouble, their life in danger from Moses. I received an electronic copy of this book for review from the author Chris Tusa on Librarything Member Giveaway. Dirty Little Angels is narrated by 16-year-old Hailey Trosclair who lives in a poor family in New Orleans. For the most part of the book I didn't know where the story was going. There was this trouble in Hailey's life and that, and I had no clue where the author will lead me to. The end was absolutely unexpected. Check out Dirty Little Angels on Goodreads! 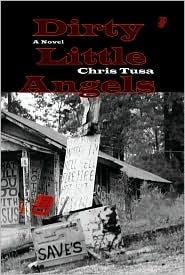 Check out Dirty Little Angels on Amazon!